The Zebra ZT410 and ZT420 Industrial Printers keep your critical operations running efficiently, offering durable industrial printing systems that can stand the test of time, both physically and technologically. Building on the field-proven reliability of the Z Series, the ZT400 adds advanced technology that drives versatility, ease of use and performance to a new level. 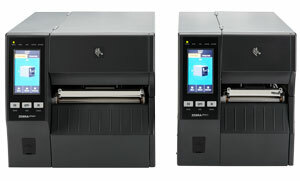 Available in three print resolutions and two print widths, the ZT400 Series addresses a broad array of applications throughout manufacturing, T&L, retail and more. 4.09" Industrial Printer, Tear Bar, 203 dpi, 14 ips, Ethernet, USB, Serial, Bluetooth 2.1, Direct Thermal, Thermal Transfer. 4.09" Industrial Printer, Tear Bar, 203 dpi, 14 ips, Ethernet, USB, Serial, Bluetooth 2.1, Thermal Transfer. 4.09" Industrial Printer, Peel, 203 dpi, 14 ips, Ethernet, USB, Serial, Bluetooth 2.1, Direct Thermal, Thermal Transfer. 4.09" Industrial Printer, Peel w/ Liner Take-Up, 203 dpi, 14 ips, Ethernet, USB, Serial, Bluetooth 2.1, Direct Thermal, Thermal Transfer. 4.09" Industrial Printer, Tear Bar, 203 dpi, 14 ips, Ethernet, USB, Serial, Bluetooth 4.0, 802.11 AC, Thermal Transfer. 4.09" Industrial Printer, Rewind, 203 dpi, 14 ips, Ethernet, USB, Serial, Bluetooth 2.1, Direct Thermal, Thermal Transfer. 4.09" Industrial Printer, Tear Bar, 203 dpi, 14 ips, Ethernet, USB, Serial, Bluetooth 2.1, 802.11 N, Direct Thermal, Thermal Transfer. 4.09" Industrial Printer, Cutter, 203 dpi, 14 ips, Ethernet, USB, Serial, Bluetooth 2.1, Direct Thermal, Thermal Transfer. 4.09" Industrial Printer, Peel w/ Liner Take-Up, 203 dpi, 14 ips, Ethernet, USB, Serial, Bluetooth 2.1, 802.11 N, Thermal Transfer. 4.09" Industrial Printer, Tear Bar, 300 dpi, 10 ips, Ethernet, USB, Serial, Bluetooth 2.1, Thermal Transfer. 4.09" Industrial Printer, Peel, 300 dpi, 10 ips, Ethernet, USB, Serial, Bluetooth 2.1, Direct Thermal, Thermal Transfer. 4.09" Industrial Printer, Peel w/ Liner Take-Up, 300 dpi, 10 ips, Ethernet, USB, Serial, Bluetooth 2.1, Direct Thermal, Thermal Transfer. 4.09" Industrial Printer, Rewind, 300 dpi, 10 ips, Ethernet, USB, Serial, Bluetooth 2.1, Direct Thermal, Thermal Transfer. 4.09" Industrial Printer, Tear Bar, 300 dpi, 10 ips, Ethernet, USB, Serial, Bluetooth 2.1, 802.11 N, Thermal Transfer. 4.09" Industrial Printer, Cutter, 300 dpi, 10 ips, Ethernet, USB, Serial, Bluetooth 2.1, Direct Thermal, Thermal Transfer. 4.09" Industrial Printer, Tear Bar, 600 dpi, 4 ips, Ethernet, USB, Serial, Bluetooth 2.1, Direct Thermal, Thermal Transfer. 4.09" Industrial Printer, Rewind and Peel, 600 dpi, 4 ips, Ethernet, USB, Serial, Bluetooth 2.1, Direct Thermal, Thermal Transfer. 6.6" Industrial Printer, Tear Bar, 203 dpi, 12 ips, Ethernet, USB, Serial, Bluetooth 2.1, Direct Thermal, Thermal Transfer. 6.6" Industrial Printer, Tear Bar, 203 dpi, 12 ips, Ethernet, USB, Serial, Bluetooth 2.1, Thermal Transfer. 6.6" Industrial Printer, Tear Bar, 203 dpi, 12 ips, Ethernet, USB, Serial, Bluetooth 4.0, 802.11 AC, Thermal Transfer. 6.6" Industrial Printer, Tear Bar, 203 dpi, 12 ips, Ethernet, USB, Serial, Bluetooth 2.1, 802.11 N, Direct Thermal, Thermal Transfer. 6.6" Industrial Printer, Rewind, 203 dpi, 12 ips, Ethernet, USB, Serial, Bluetooth 2.1, Direct Thermal, Thermal Transfer. 6.6" Industrial Printer, Cutter, 203 dpi, 12 ips, Ethernet, USB, Serial, Bluetooth 2.1, Direct Thermal, Thermal Transfer. 6.6" Industrial Printer, Tear Bar, 300 dpi, 10 ips, Ethernet, USB, Serial, Bluetooth 2.1, Direct Thermal, Thermal Transfer. 6.6" Industrial Printer, Peel, 300 dpi, 10 ips, Ethernet, USB, Serial, Bluetooth 2.1, Thermal Transfer. 6.6" Industrial Printer, Rewind, 300 dpi, 10 ips, Ethernet, USB, Serial, Bluetooth 2.1, Direct Thermal, Thermal Transfer. 6.6" Industrial Printer, Cutter, 300 dpi, 10 ips, Ethernet, USB, Serial, Bluetooth 2.1, Direct Thermal, Thermal Transfer. 4.09" UHF RFID Printer, Tear Bar, 203 dpi, 14 ips, Ethernet, USB, Serial, Bluetooth 2.1, Direct Thermal, Thermal Transfer. 4.09" UHF RFID Printer, Tear Bar, 300 dpi, 10 ips, Ethernet, USB, Serial, Bluetooth 2.1, Direct Thermal, Thermal Transfer. 6.6" UHF RFID Printer, Tear Bar, 203 dpi, 12 ips, Ethernet, USB, Serial, Bluetooth 2.1, Direct Thermal, Thermal Transfer. 6.6" UHF RFID Printer, Tear Bar, 300 dpi, 10 ips, Ethernet, USB, Serial, Bluetooth 2.1, Direct Thermal, Thermal Transfer.